Cub scout den meetings that don't include the entire pack. Meetings for individual Girl Scout age groups, like Brownies or Cadettes. Order of the Arrow campouts that are only open to OA members. Special events that include alumni of the troop or pack. All of these situations involve a subgroup of the troop or pack. With our new Dynamic Subgroups, we created a powerful mechanism for defining these subgroups based on the current attributes of your members. Once your subgroups are defined, you can create events that are limited to the members of a subgroup. You can also send an e-mail to a subgroup. Designate inactive members as "alumni" and include them in a dynamic subgroup. Adults no longer enter their own training with the default security setting. Leaders can opt out of the public "Our Leaders" page. You can remove the ability for scouts to add their own merit badges. Six months into their first year with TroopWebHost, this website gives you a complete picture of the scouting experience at Troop 316. 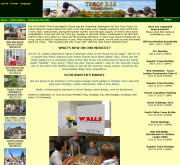 Aside from the comprehensive troop information, there are numerous photos and videos in the galleries (one of which is featured in Katie�s Corner), a rockin� Scout Wall of Fame, and a unique page with current weather forecasts for upcoming troop events! Love that. Troop 316 of Saugus, California, we salute you! Can you name a person who was a driving force in the establishment of both Boy Scouts and Girl Scouts of America? Click here for the answer, and to watch a fun video from our Website of the Month�s Eagle Scouts!